The deep backbends, graceful balancing acts, and seemingly impossible stacks of human bodies make for some serious yoga eye candy. But flying high (and snapping the obligatory photo) is only one, very small, part of an AcroYoga practice. Equally, balance and strength are essential, but neither needs to be of the superhuman variety. AcroYoga is a vibrant, playful – and relatively new – style of yoga, combining traditional yoga asanas with the dynamic movement of acrobatics. And like traditional yoga practice, the focus on breath awareness grounds familiar postures like bird, camel, and mermaid – only, with acro, the full expression of poses takes place midair. 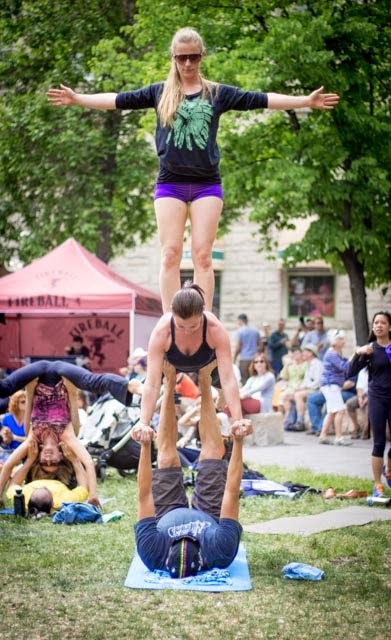 Members of Winnipeg’s AcroYoga community can be seen practicing in parks and outdoor festivals throughout the summer. 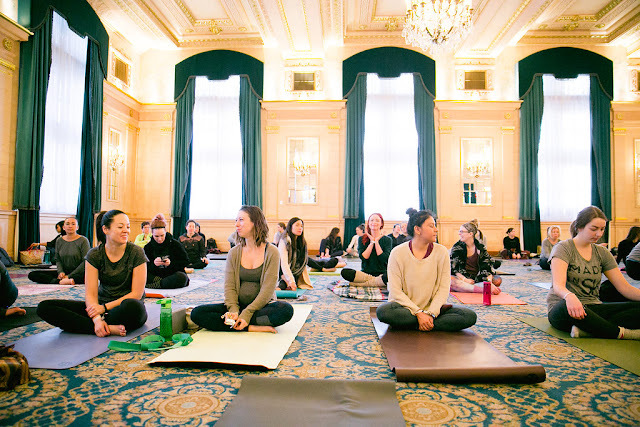 Yoga instructor and massage therapist Lesley Brown brought AcroYoga to Winnipeg only a few years ago, in 2011, after attending her first of what would become many workshops in the United States. “This person was like, ‘Can I fly you?’ and I didn’t know what that meant,” she recalls, laughing. Returning home, Brown was hooked, and eager to continue her practice. Realizing she was probably alone in this pursuit, she ordered the AcroYoga manual and started hosting acro gatherings, or ‘jams,’ in her back yard. Soon this led to teaching acro classes at the Rudolph Rocker in Winnipeg’s Exchange District and then onto Peg City Yoga, where she continues to instruct today. In the process, Brown, one of Canada’s few certified AcroYoga instructors, watched as a community blossomed around her. This was Heather Whittaker’s first time trying AcroYoga. It’s not difficult to understand why. While AcroYoga can certainly be intimidating to newcomers, the energy that Brown and the acro community have created is infectious. Newcomers of all levels are welcomed to class with a smile. You are unlikely to find a yoga class where there are more ear-to-ear grins, squeals of joy or high fives. The focus on trust and playfulness makes for an especially supportive environment. There is always someone there to (literally) catch you when you fall. AcroYoga instructor Lesley Brown spots. AcroYoga ‘jam’ at the Old Market Square during the TD International Jazz Festival, June 2014. Don't let your fear of falling dissuade your curiosity. Counterbalancing every flyer is a partner, the base, who supports and keeps the movement firmly rooted to the ground. A spotter guides every posture, transition and ‘pop.’ Brown stresses this in her classes, which makes for a safe practice that is accessible to everyone. And perhaps it’s this supportive environment that responsible for what is, for many newcomers, the most striking thing about acro: the relative ease of getting into the balancing postures that only moments earlier seemed wholly impossible. But acro is more than just a test of strength or display of flexibility. Because it’s an activity typically done in pairs, it’s just as much an exercise in communication, understanding and compassion. Thai massage and therapeutics play a major part. Here, you’ll find friends and strangers speaking with respect, understanding and trust. And while yoga is typically a solo activity, acro forces participants to bring the mindfulness and awareness that are cultivated in individual practice into our relationships with others. That empowering, energizing feeling that comes when balancing metres in the air is what keeps many yogis coming back. But it’s just as much about pushing personal barriers and boundaries. It seems that AcroYoga is, by design, meant to push our expectations, limits and zones of comfort. And most of us can probably use the occasional gentle reminder to let go, trust, and see just how high we can go. AcroYoga classes – accessible to all levels – are being offered all summer at Peg City Yoga every Thursday at 7:00pm. Beginners and drop-ins welcome. 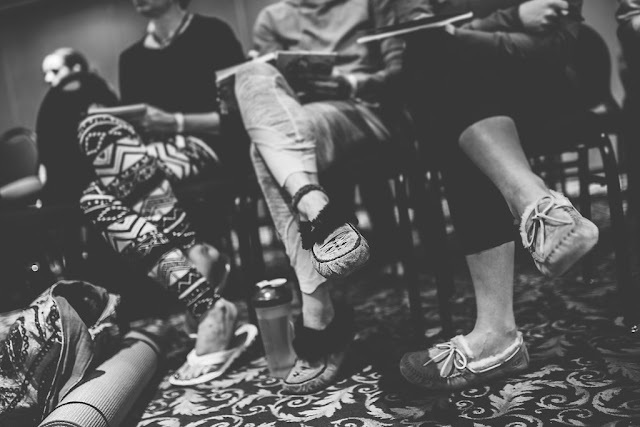 Be sure to join the AcroYogaWinnipeg Facebook group for updates on workshops and park jams. Lesley Brown will be teaching an AcroYoga class at Prairie Love this September. Get your tickets here. Sarah Carson is a researcher, writer and girl of a thousand hobbies based in Winnipeg, Canada. You can connect with her on Instagram or by checking out her website.